June 23, 2003, 2000 PDT (FTW) --Forget about terrorists. Don't give another thought to SARS. The single greatest threat to the U.S. right now comes from a critical shortage of natural gas. The impending crisis will affect all consumers directly in the pocket book, and it may well mean that some people won't survive next winter. The problem is not with wells or pumps. The problem is that North America is running out and there is no replacement supply. Natural gas stocks are currently at 1,199 billion cubic feet (Bcf), over 39% short of what they were last year at this time (1,954 Bcf). The storage refill season has so far proceeded at a very modest pace, though buyers recently pushed up their purchases to record levels.1 The peak storage refill period runs from May through mid-July. By late July, summer electricity demand usually limits the amount of natural gas available for storage. Weekly storage levels tend to taper off through the summer, rise again slightly in September, and then drop to nothing as the winter heating season starts up in October. There is very little time left to replace the record withdrawals that occurred this last winter, and the peak refill season is nearly over. What is more, analysts are saying that we need to do more than just replace what was used last winter. In order to avoid a crisis next winter, we must build our storage up to record levels. Let's take a look at the Natural Gas (NG) situation in an effort to understand what is happening. And then let's lay in an extra load of firewood for that woodstove, and see about double insulating the household before next winter. Even though oil and gas are almost always found in the same places and originate from the same organic matter, let's remind ourselves that Natural Gas is different from oil by nature. Being a gas as opposed to a liquid, once a well is drilled it takes relatively little effort to pump out the gas. 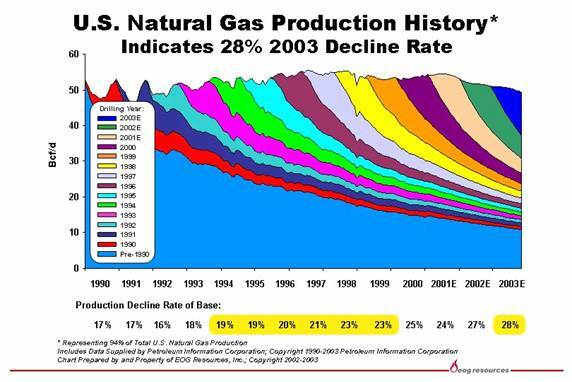 There is little tapering off in production, little need to expend more energy driving the gas to the well hole. Natural Gas production profiles generally have a rise, a plateau, and then a steep cliff with little warning as the pressure in the well drops and the play peters out. Likewise, NG reserves are much more responsive to drilling than are oil reserves. The more wells you sink into a gas reserve, the more NG you will extract, and the quicker you will deplete the reserve. We must also bear in mind that, while the world as a whole is nowhere near peaking in NG production, the same is not true for North America. There may be massive known reserves of NG still untapped around the globe (especially in Russia), but that does us little good here. This is because NG is not easily transported overseas. First it must be chilled to liquid form in special processing plants, loaded onto specially built Liquid Natural Gas (LNG) tankers, shipped to specially designed offloading ports, and then reverted back to gaseous form. All of this cuts into the net energy of LNG and adds to the price. And the amount of LNG that can be shipped in this manner is limited by the size and number of tankers and the length of time for one full trip (from the Middle East to the US and back, with loading and unloading, up to half a year per tanker according to some sources). The US has few LNG tankers and still fewer offloading ports, though there are plans to build more. It is unlikely that we will ever meet a significant portion of our NG demand through the use of LNG. The California gas crisis of 2000-2001 was a largely manufactured crisis due to greed in the privatized market. Energy sharks were able to magnify a slight NG deficit into a full-blown crisis through manipulation of the market and manipulation of regional NG supply. This was the fruit of deregulation. Unfortunately, the criminal activities of the California energy sharks have tainted our view of the NG situation. Now, whenever a shortage causes NG prices to rise, people tend to think the situation is manufactured and manipulated by the industry. And NG suppliers have tried beyond reason to keep prices down and the supply up, least they be tainted by the memory of the California fiasco. Therefore, NG production in 2002 was allowed to slide down to a paltry level, and NG storage was unprepared for the drawdown that occurred last winter. Winter demand in 2002-2003 hit an all-time high, depleting storage by a record 2550 Bcf. By early April, storage had bottomed out at a dangerously low 623 Bcf, more than 40% below normal storage for that time of year. Spot prices skyrocketed to $10.00 per Million British Thermal Units (MMbtu's). This led to NG prices of as high as $30 per million cubic feet (Mcf). Prices dropped slightly following the end of the winter heating season. However, in the last few weeks, prices have begun to rebound due to increasing storage injection demand---sending spot prices to over $6.00/MMbtu as of June 4th.4пїЅ Prices are likely to continue increasing, as the power industry desperately seeks to rebuild its reserves through the summer. Competition with summer electricity demand could send prices back to their late winter highs. Natural Gas is also the feedstock for hydrogen production. As NG prices are expected to remain high for the next several years, one cannot help but wonder what impact this will have upon the hydrogen economy fantasy. Energy Secretary Spencer Abraham has summoned energy industry leaders to an emergency June summit to discuss the NG situation.14 It is likely that this summit will result in a call to roll back environmental regulations on government-controlled lands and offshore areas. It is also likely that the summit will result in a bargain sale of NG drilling rights on public lands. Beyond this handout, the Department of Energy (DOE) believes that market forces will resolve the NG dilemma. The agency believes that higher NG prices will result in increased profits for operators, who will in turn have more money to spend drilling NG wells.15 The DOE does not realize that the industry is currently running simply to stand still. US production history shows that new wells are being depleted more quickly all the time; the current decline rate is 28%. While this is partially due to growing demand, it is also due to the fact that the large plays of NG are all aging and are in terminal decline. Newer plays tend to be smaller and are produced (and depleted) quickly in the effort to maintain overall production levels. Once again, economists fail to recognize that throwing more money into production will not solve the problem if a non-renewable resource base is depleted. Another myth supported by the DOE as well as many industry insiders is that the price of NG cannot rise above the equivalent price of oil for any sustained period of time---the logic being that users will switch from NG to petroleum distillate until NG prices settle back down. This may have been true in the past, but it does not hold true for today's market. In the current market, most opportunities for fuel- switching have already been taken, as mentioned above. NG is currently priced over twice as high as distillate per MMbtu.16 In such a market, no one in their right mind would continue to burn NG if they had the capacity to switch. Moreover, inventories of oil products in the US are at low levels right now. Inventories of distillate are particularly low because, in recent months, refineries have been converting substantial amounts of distillate into gasoline. Due to increased demand, these inventories are not expected to be replenished any time soon. As a result, we simply don't have the physical supply of distillate to allow for large scale switching. There are many additional factors limiting the amount of fuel switching that may occur. At prices below $10.00/MMbtu, it is unlikely that remaining fuel switching will exceed 1.0-1.5 Bcf/day. This would only free up an additional 175-250 Bcf of NG for injection into storage between now and late October. Should NG price hikes result in a drilling frenzy, the result would probably resemble what happened to the Ladyfern deposit in Northern British Columbia. Discovered in 1999, Ladyfern was considered the largest NG discovery in North America. At one time, Ladyfern was thought to contain over one trillion cubic feet of NG, but experience has cut that number to less than half. Ladyfern was also expected to make up fully one quarter of Canada's NG production for some time to come. Will the DOE learn from Ladyfern as it seeks to roll back regulations in an effort to spur NG production? Will the NG industry remember the lesson of Ladyfern as they are drawn by the lure of skyrocketing NG prices? As NG production continues to diminish in North America, rising NG prices and rising NG demand could result in the overproduction of other plays. The NG storage injection season normally runs from April to late October. But the majority of the refill occurs between late April and the middle of July---the period after the end of the winter heating season, but before the summer cooling season increases electricity demand. This means there are only a few weeks remaining in the peak refill season. And as time goes by, it becomes increasingly difficult to make up for deficits from previous weeks. Until the week ending May 30th, weekly injection rates remained low. Part of the reason for this was the need for local distribution companies to obtain permits to allow them to change their purchasing habits. These permits have now been obtained and the local distribution companies are beginning to boost their purchasing orders. Add a hot summer onto this, and in short order, we could see NG prices return to the $8.00-$10.00 range experienced last winter. This winter saw a record 2,549 Bcf withdrawal from storage. Most analysts claim this was due to the cold winter. But even before the winter heating season had started, storage had fallen by more than 500 Bcf relative to the five year average.22пїЅ So we began the winter season in a very precarious position. While the Eastern United States did experience a long and bitter cold spell in January and February, the winter was actually slightly milder than usual for the winter heating season as a whole. As measured in gas-weighted Heating Degree Days, the weather was 3% milder than historical norms. While severe cold weather in January and February did contribute to the NG withdrawal rates, in the coldest week of the winter the increase in NG consumption attributable to weather was less than 30 Bcf. Even after normalizing the data for weather, withdrawal from storage for the winter season was 843 Bcf greater than expected.23 Why this enormous withdrawal? The answer is that demand for NG has been increasing over the past several years beyond the Energy Information Administration's assessments for necessary storage. Meanwhile, NG production in the United States and Canada has fallen off the cliff. The only reason why this cliff has not become readily apparent is that the NG industry has been bringing new fields online in a frantic effort to keep production levels from dropping too rapidly. Unfortunately, very few of the new plays have high production levels, and most of them play out very quickly. In effect, NG production is running faster and faster in an effort simply to stay in place, while demand is leaving it far behind. It is almost a certainty that there will be a Natural Gas crisis this year, and you will not have to wait until winter to see it begin. Prices are already beginning to move upward. By the end of August NG prices will probably be back in the $8.00-$10.00/MMbtu range, and possibly higher. Such prices for summer are unheard of, and there is no telling how it will affect the market, or our electric bills. This will be the beginning of the crisis. But it will grow worse as we go into winter. How bad it becomes depends on how much NG has been injected into storage by the beginning of winter. If storage injections over the next several weeks continue at the same pace as this past week (114 Bcf) but remain 15 to 20 Bcf below the 130 Bcf/week needed to reach minimum levels of storage, then we will likely see a repeat of last winter, with NG prices soaring in the second half of the season. If storage injections over the next several weeks fall back below the 102.1 Bcf injection levels of 2001, then this coming winter will likely be worse than last year. At this rate, we will enter the winter heating season at dangerously low levels. Public safety could be endangered. And now let's talk about the weather. A mild summer and a mild winter would be a blessing. Mild weather for the entire year would not necessarily prevent price runups or the depletion of storage, but it would ease the sense of emergency. On the other hand, a hot summer and/or a cold winter would worsen the crisis. A hot summer would increase electricity demand for cooling, making it more difficult to meet storage injection goals. A severe winter could create a national energy emergency such as we have never seen before. With storage below minimum and a severe winter, it is not impossible that we could completely deplete storage. In the worst case, there would be many stories of people freezing in their homes. Prices would skyrocket. The chemical and fertilizer industry would be sent reeling. Overall, industry would slow down drastically and the economy would suffer. Come the summer of 2004, farmers would go out of business and the price of food would likely begin to climb. And the task of refilling storage in 2004 would be even more daunting than it is this year. For now, we can hope for mild weather, watch the weekly injection rates, and consider adding in an extra supply of wood for the fireplace or double insulating our homes. It may be time to look at investing in passive solar heating for the home. 3 Bayer Calls For Reliable Supply Of Natural Gas In North America. CNN Matthews, 5/1/2003. 4 Op. Cit. See note 2. 9 Higher natural gas price increases cost of nitrogen fertilizers, Repps Hudson. 4/28/2003. 14 Abraham calls summer natural gas summit. UPI National Desk, 5/16/2003. 16 Days of Shock and Awe About to Hit the Natural Gas and Power Markets Part 2, Andrew Weissman. Energy Pulse, 5/9/2003. 20 Op. Cit. See note 2. 26 Op. Cit. See note 1. 27 Op. Cit.пїЅ See note 16. 28 Op. Cit. See note 1. 29 Op. Cit. See note 16.